One of the most powerful trends we have identified through cluster analysis is the breakdown of the distinction between developed and emerging markets. Relationships between global equity and currency markets are constantly changing through time. Cluster analysis helps us to understand this and reveals some unexpected patterns. 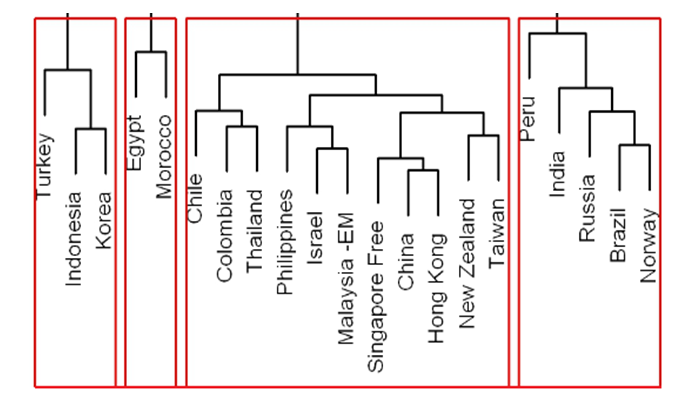 We find that, for example, Mexico has much in common with Canada, whilst Brazil and Norway share the same features. For anyone with children, the thought of a chaotic day in the playground might seem an odd place to begin a discussion on investment. Nevertheless, let’s set the scene: it’s a hot day, the bell rings for lunch, children emerge from their classrooms and begin to gather in groups, some play in the sunshine, others in the shade, some gather amongst their own classmates, others within different age groups around a familiar game. An unusual noise rings in the air, there is a stream of movement as an excitable crowd forms around an ice cream van. Sometime later, the children return to play. Some now join different games, whilst some decide to cross to the other side of the playground to play out of the sun. This analogy helps to illustrate how we can think about the relationships between different assets or asset classes and how these relationships evolve over time, often in response to specific events. Our metaphorical ice cream van might be Quantitative Easing or a global energy shock and, just as the children move between different groups, cluster analysis expresses how different markets react and fall into new correlations after events. 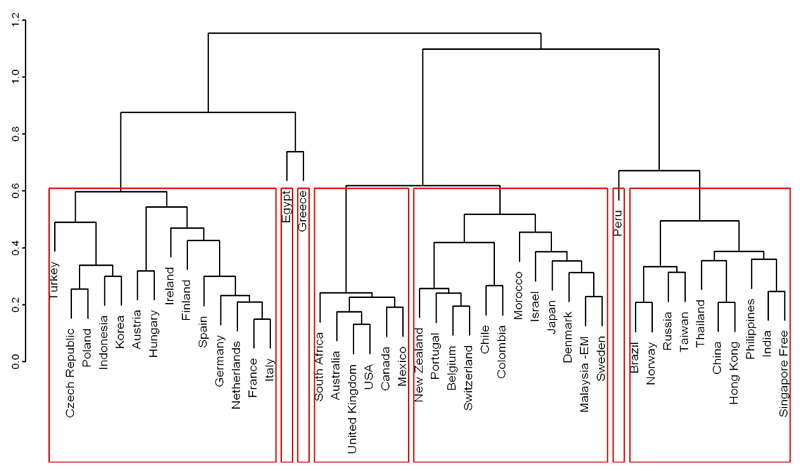 Through cluster analysis objects displaying similar behavioural characteristics or tendencies are grouped into smaller and smaller clusters. So, in the analogy above we would have two large clusters i.e. sunshine and shade and within them smaller clusters: football, hop-scotch, skipping etc. When applied to financial markets this process of clustering enables us to identify key return drivers and inter-market correlations. This informs our top-down investment process which is built around macro and thematic analysis, country allocation and active currency management, helping us execute asset allocation decisions efficiently. In particular, it has allowed us to question a number of widely-held assumptions and key tenets of received investment wisdom and while we would acknowledge the potential limitations of backward-looking analysis, one crucial finding is precisely that markets are dynamic and highly changeable. The chart below is an example of how stocks can be sorted into clusters based on their return characteristics over different time periods. 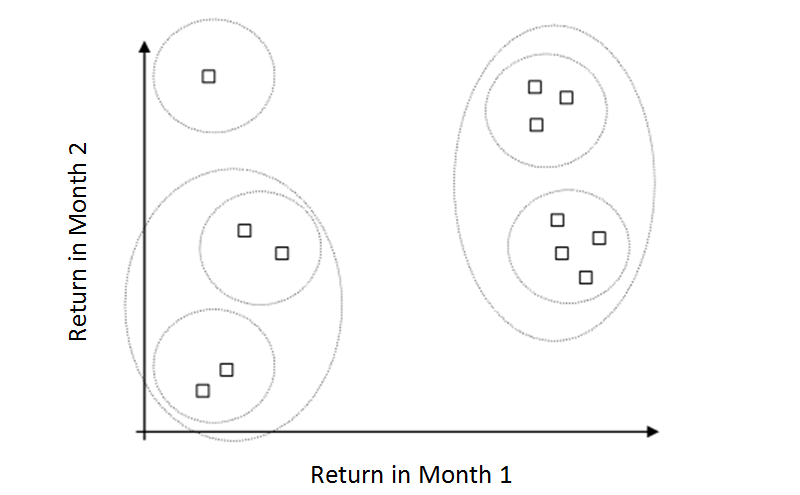 Applying statistical analysis techniques to equity returns over multiple time periods, stocks are paired together one by one into small clusters which are then grouped together to form larger ones and so on. The example below uses two periods or factors, but in practice we can use many more. The chart we derive from this clustering (shown above) provides a useful way of observing and summarising the hierarchy of correlations. The height on the y-axis of the cluster diagram (the ‘dendrogram’) is inversely proportional to the correlation, which is calculated as 1 – distance between clusters. 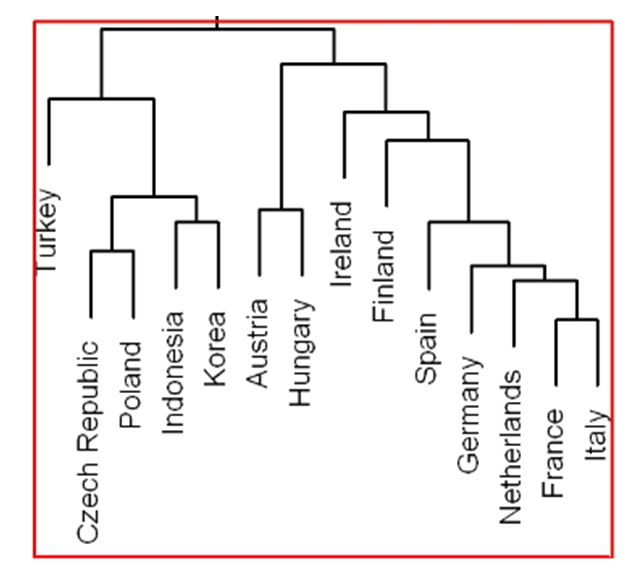 If clusters are highly correlated, they will appear nearer the bottom of the dendrogram; for example, the Czech Republic and Poland have a correlation of nearly 0.8 (1 – 0.2 from the y axis). Based on our analysis we have identified seven clusters, each of which is identifiable through a red box in the chart. We used the three-year periods ending Dec ’97, Dec ‘00, Dec ‘03, Dec ‘06, Dec ’09 and Mar ’12. Index driven distinctions between Developed and Emerging Markets or between Asia and the rest of GEM are entrenched within the investment community’s asset allocation decisions. However, our analysis shows this is an overly simplistic way of understanding the relationship between equity returns in these markets. Specifically it shows that correlations are dynamic, event driven and multi-dimensional – essentially more complex than a simple question of DM vs EM. In fact, one of the most powerful trends we have seen between 1995 and today, is the breakdown of the DM vs EM distinction as other trends have emerged. One relationship we have observed, in clear contradiction to the DM vs EM idea is the rising correlation of local currency index returns between the ‘energy bloc’ of Brazil, Russia and Norway. This cluster first emerges between 2006 and 2009 when the correlation of returns increases significantly. Then, during the 2009-2012 bull market in oil the correlations strengthen further and the cluster becomes even tighter, as seen above. Another trend demonstrating the dynamism of correlations is the emergence of the BRIC cluster. If we look at local currency returns pre-2000 there is little correlation, each of the BRICs appears in a different cluster (debt defaulting Russia forms one all of its own). Post-2001, when Goldman Sachs famously coined the term and BRIC emerges, via themed funds and ETFs, as a single investment destination, correlations visibly increased such that by 2009 the four countries are all found in the same cluster (see chart on following page). While this cluster does contain other emerging Asian markets like Taiwan, Thailand and the Philippines, many other emerging markets stay in other clusters as they continue to be defined by factors such as size or proximity to Europe rather than merely their status as a GEM nation. Indeed the idea of country returns being correlated according to the relative size and liquidity of markets has become more central over the last couple of years as liquidity provision (via QE programs, LTROs) has been important in driving those smaller countries at the margins. In our analysis we note between 2009 and 2012 a cluster of small countries, both developing and emerging, including New Zealand, Chile, Colombia, Morocco, Denmark, Israel, Malaysia and Switzerland which had closely correlated returns. Here it seems that the overriding impact of liquidity provision has had a disproportionately big impact on the ‘equity risk premium’ embedded in these countries and therefore returns, blurring conventional EM / DM distinctions. These trends highlight the overlapping themes which cause correlations within markets but also the mutability of these themes. 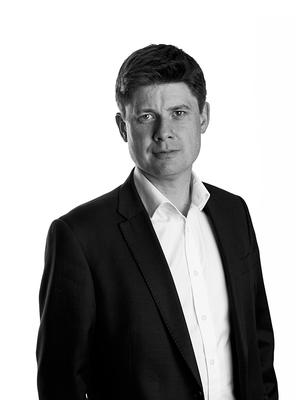 Market returns do not obey simple index distinctions and the active manager’s capacity to recognise these trends and react to them by making the appropriate top down allocations is a key driver of outperformance. Turkey’s equity market returns are broadly correlated with emerging and peripheral European countries of the Czech Republic, Poland, Hungary and Austria (see chart 4 below), but the Turkish lira displays quite different tendencies. Between 2005 and 2008, the lira’s returns were most closely correlated to the South African rand and Brazilian real. However, since 2008 while the rand has remained the most similar currency to the lira, the real has become more closely correlated to the Norwegian krone, corroborating the rising importance of the ‘energy bloc’ indicated by underlying equity market returns. Interestingly, while the Turkish equity market is defined by its status as part of emerging or peripheral Europe, the lira expresses its status as a GEM currency and in particular as a barometer for global risk appetite. An appreciation of this ‘schizophrenia’ of Turkish assets can allow fund managers to better manage risk and maximise returns. This bifurcation of equity and currency returns is also evident in the case of Mexico. As discussed earlier, recent years have seen the emergence of an energy cluster comprising Brazil, Russia and Norway, but at the level of equity returns this has not included Mexico, itself a significant energy producer. Rather in recent years Mexico has been located in a cluster containing the other NAFTA members of Canada and the USA as well as other developed markets like the UK, and very much distinct from the energy cluster. However, we find the Mexican peso is in the same cluster as the Russian ruble, the real and the krone. A final example of the different correlations between currencies and underlying markets can be seen in the Asian nations. 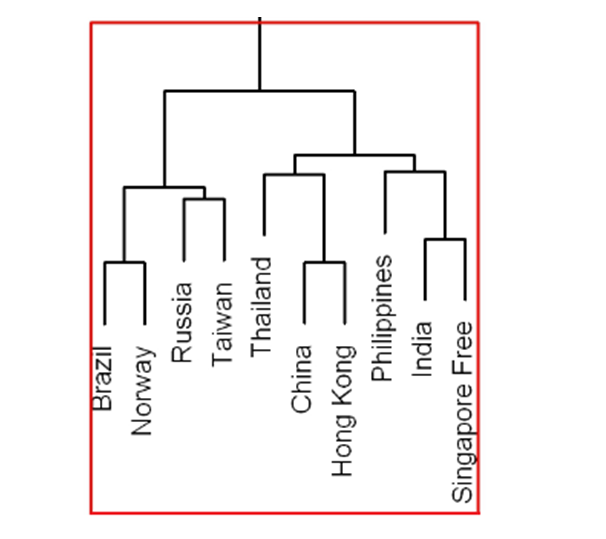 While equity market returns for most Asian countries between 2009 and 2012 fall into the same broad cluster as the energy grouping of Brazil, Norway and Russia, the currency returns form very much their own distinct cluster in an Asian bloc. BRIC as a concept is clearly reflected in equity market returns, but at the currency level this relationship breaks down; Brazil and Russia remain closely correlated to each other while for both the correlation to Asia is much lower. The significant differences in currency clusters to those observed at the equity market level are of vital importance to the base currency investor. The BRIC cluster identified in Chart 3 becomes even more pronounced when analysed in US dollar terms (see chart 5) albeit China moves slightly away from its BRIC family towards the other US dollar pegged countries in this analysis. On top of that, US dollar returns drive Turkey away from the emerging/peripheral Europe local currency cluster into a unique cluster with Indonesia and Korea. By understanding how GEM currencies cluster and how that is likely to evolve over time, the investment process can be improved, often highlighting the need for a currency overlay to complement the equity selection process. The drivers of markets and correlations between them are constantly changing especially for a universe as diverse as Emerging Markets. Having the ability to stay on top of these changes and to know exactly what the key correlations/drivers are can give the investment manager a significant edge in their quest for alpha. Cluster analysis is a valuable tool in achieving this: it can provide an edge in highlighting the importance of dynamically managing asset allocation, avoiding arbitrary and overly simplistic distinctions such as Emerging and Developed Markets and the importance of drilling down to get a more precise picture of what is driving returns. Investors hoping to link the performance of markets according to traditional index definitions are missing out on the evidence of the emergence of new and more important relationships instrumental in return generation. Finally, cluster analysis makes clear how an appreciation of relationships between currencies is important for base currency investors.